The November announcement of a memorandum of agreement signed by Air Canada and Air China to stimulate growth in air traffic between the two countries could mean Montreal is a step closer to getting its long awaited non-stop Montreal-Beijing route. The board of trade is also part of a wider initiative to increase more direct flights overall and ensure existing ones continue. This involves raising awareness in the business community to help increase passenger load factors on long-haul direct flights from Montreal. It’s part of “I See Mtl,” a project launched in November by Montreal business leaders of 180 formal commitments to revitalize the city. Joining the board of trade are Aéroports de Montréal (ADM), Tourisme Montréal and Montreal International, whose mandate is to attract foreign direct investments, international organizations and international strategic workers as well as promoting the competitive and international environment of Greater Montreal. Those figures were contained in a study by KPMG-SECOR to evaluate Montreal’s air service in comparison with other North American cities and to identify potential areas of development. Part of the study looked at the number of people travelling from Montreal to other cities via an intermediary airport, because Montreal did not have a direct flight to those cities. And San Diego was one of eight cities that had the minimum required demand to justify a daily frequency. But only three had a sufficient level of demand throughout the year to provide a minimum level of profitability. Apart from San Diego, they are San Jose and Beijing. Four others, Rome, Barcelona, Lyon and Athens could support seasonal service, while Beirut could be profitable, but cannot currently be served for national security reasons. While Montreal is busy trying to attract new flights, it is being blindsided by Plattsburgh International Airport, which is spending US$55 million to accommodate mostly Canadian travellers at what Air Canada president Calin Rovinescu has called, “Quebec’s fastest-growing airport.” Not surprising as about 85 per cent of Plattsburgh’s 150,000 passengers last year were Canadians, overwhelmingly Montrealers and part of an estimated 4.5 million Canadians to fly out of cross-border U.S. airports annually. 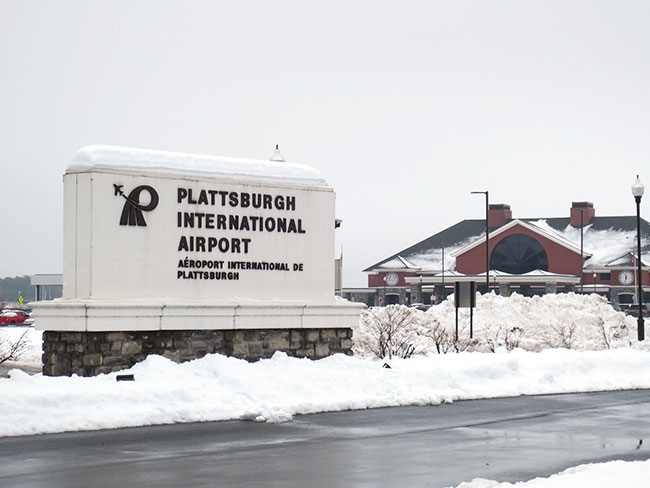 Plattsburgh, just over an hour away by car, expects to double the 150,000 figure in less than 10 years and most coming from Quebec, according to Garry Douglas, president and CEO of the airport and of the Plattsburgh North Country Chamber of Commerce. The facility bills itself as Montreal’s U.S. airport and Douglas calls Plattsburgh Montreal’s U.S. suburb. And a lot of the signage at the airport is bilingual. Burlington is actually a bigger threat than Plattsburgh, because it has more flights and airlines than Plattsburgh, including Delta and JetBlue, but it’s a good two-hour drive from Montreal, Cherry pointed out.